As a trader you need access to the world's leading derivatives exchanges including CBOT, CME, Eurex, Euronext.liffe and more. You need fast, straight-forward order entry and management with real-time quotes, positions and P&L, and you need the ability to trade Mini S&P, FTSE100 and all other major indices. 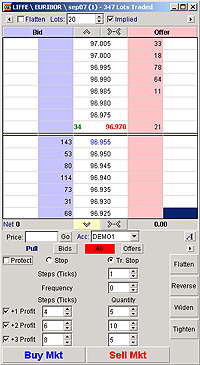 J-Trader meets all of your needs.